The common notions of the beginning of civilizations is that it was remarkably better than a nomadic hunter and gather type of existence. Anthropologist James C. Scott argues that early cities an cities throughout the history were so miserable that these early states went to war in order to capture slaves to keep the cities operating and that’s a big reason why slavery was so endemic to the so called civilized world. Guest: James C. Scott is Sterling Professor of Political Science and co-director of the Agrarian Studies Program at Yale University. 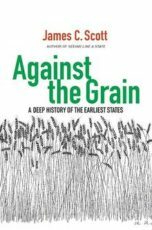 He is the author of the book Against the Grain: A Deep History of the Earliest States.